Video Blogs are gaining popularity in the blogosphere recently. Video Blogs are termed as ‘Vlogs’ and the Video bloggers are called ‘Vloggers’. Setting up a Vlog on WordPress can be achieved with custom Video Blogging Templates, some of the most famous being eVid, WooTheme, Press75 etc. Adding Video to your posts can dress up the content. By using Videos, you give your content a dimension that you can’t express in plain text. Through visual imagery, you can call attention to your post and add depth to it. The same goes for adding any other media files to your posts and blog, e.g., Image, and Audio. Video lets you provide entertainment through moving, talking (or singing!) streaming video. Audio files let you speak to your visitors and add a personal touch. Many bloggers use video and audio to report news and to broadcast Internet radio and television shows. The possibilities are endless! Create your website with the best WordPress themes available in the market. Most of the people say WordPress is one of the highly-valuable content management systems which gives a lot of features for WordPress theme-based websites. Today every business owners are liking WordPress video themes, because these themes are suitable for all kinds of video sharing portals, embed codes support, create multiple video categories, show popular videos and recent videos, share social networking icons, multiple browser support and compatibility with Joomla 3.0 version. These themes mainly focus on video blogs and video websites. It’s one of the best video sharing themes for WordPress platforms. We can make best video theme blogs or websites use this WordPress theme with these themes are highly power designs and HTML5 support. There are a lot of free-of-cost and premium WordPress themes available in WordPress platform. 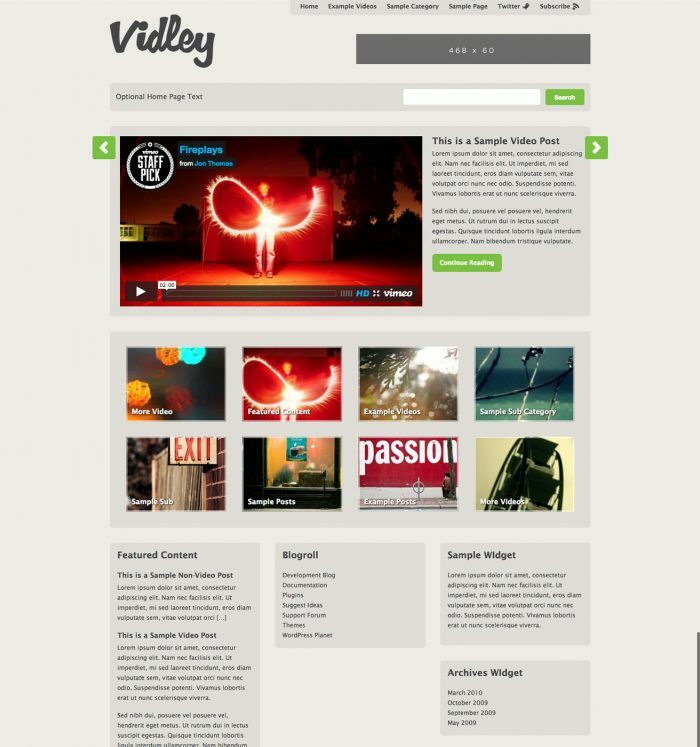 Today I have suggested some best WordPress video themes for you. Feel free which WordPress themes like your blog or website download and use this list. Enjoy! 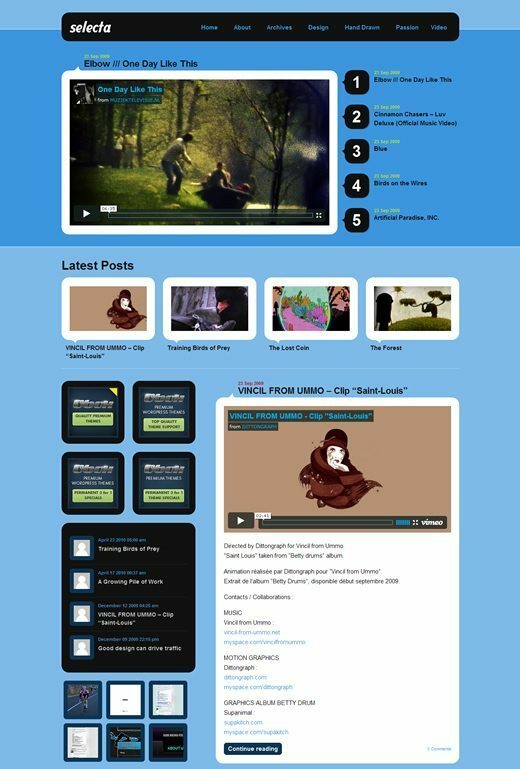 eVid is a theme designed for video bloggers. I have set it up to easily integrate videos from video hosts such as Youtube, Vimeo, Veoh, MetaCafe, and so on. This theme does not have a native video player, but it does include a custom video interface with added “blogger-related” functions. This theme is only for sites that plan to showcase videos within their post pages. I have tested the theme with all the most popular video hosts, but I expect that it will work with any website that offers a flash embed code. Vivo Video Theme is a powerful WordPress video theme with multiple features like different color layouts, signal click and auto install, fully customizable and support theme guide. This video gallery theme entirely focuses on movie website only with include content slider, my gallery built in, banner positions, page navigation, threaded comments and much more. 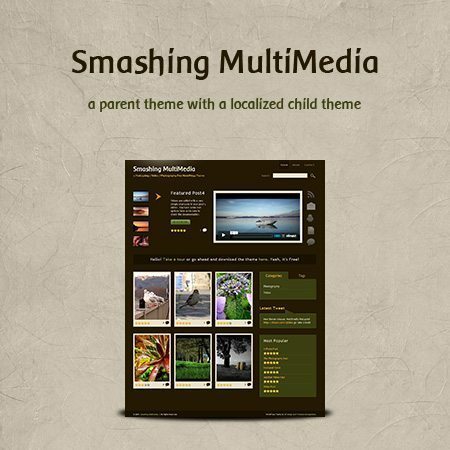 Create your own photographer’s website using smashing theme. We can easily customize child theme with this theme released GPL License. Create rounded edges and bold, modern color, PHP5 or higher and compatible with WordPress 3.0 or greater. This theme only suited for blog websites. Selecta’s rounded edges and bold, modern color palettes make for a fresh theme that’s best suited to blogs where the video will be the primary focus. The wider-than-usual frames around thumbnails and videos bring to mind the retro-cool of Polaroid photographs and old home movies. Making use of the multimedia WordPress theme. 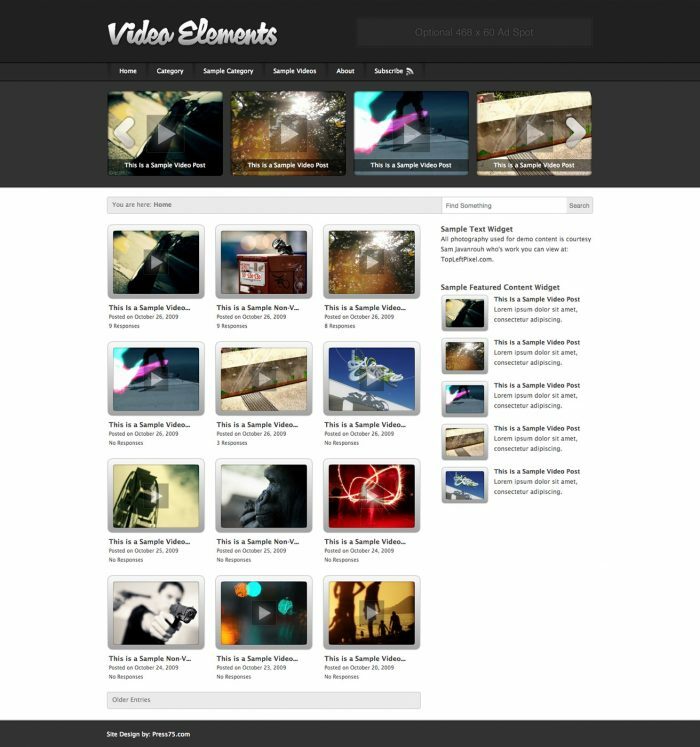 This theme has compatible with all WordPress video plugins with like the YouTube theme. We can create an easy way for video blogging and all video sites like YouTube, Google-Videos, Dailymotion, Metacafe, Myspace, Flickr, and Vimeo. 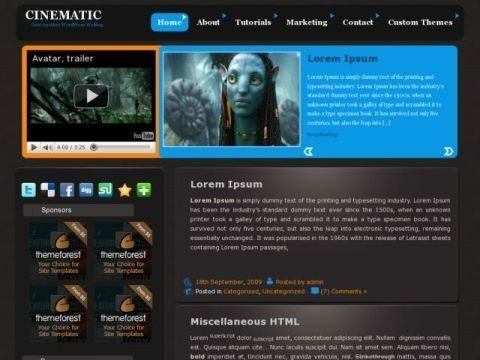 Video theme is a beautiful WordPress theme developed by Foxinni. You can create a simple WordPress functionality and allow all kinds of video sites like YouTube, Meta Cafe, MySpace and much more. 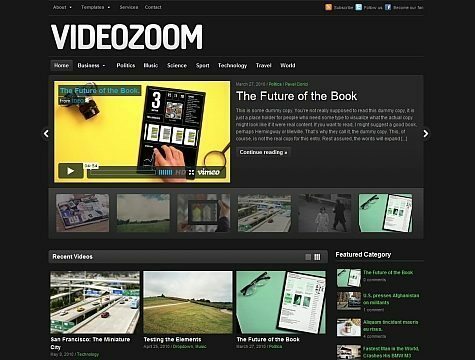 VideoZoom is a fully customizable elegant WordPress video template which supports all video sites by default. It features post that is related to categories which give slideshow effect to users. 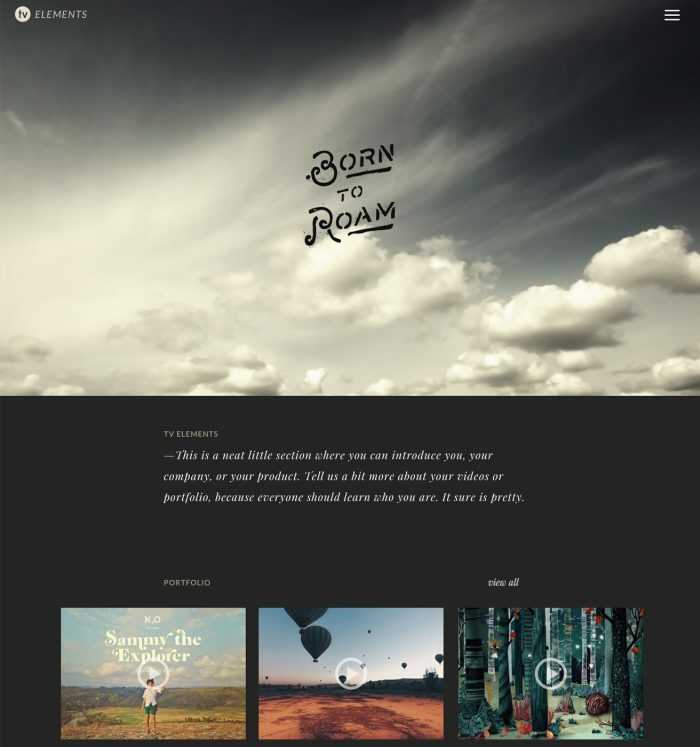 Adventure theme is a beautiful photography WordPress theme which supports all kinds of video formats. This theme is compatible with version 3.0, create multiple backgrounds, two skins and 100% liquid layout. It’s one of the best free WordPress themes supporting full screen on all videos developed and maintained by Themeforest. This theme is compatible with all kinds of mobile phones like, iPhone, Android, and Smartphones. Video stream WordPress theme by apptha.com offers you to build a video sharing website use this theme. It allows categories, recent post, social sharing icons and thumbnails with pagination. 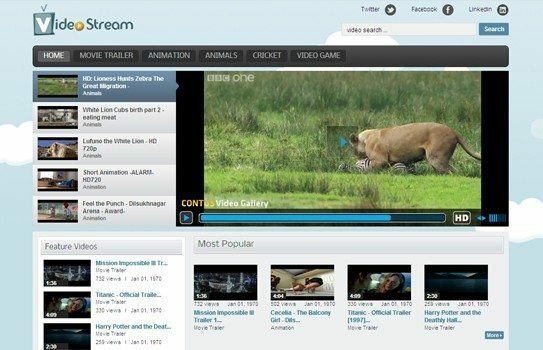 Video Stream is a premium WordPress theme for building a video sharing website. This WordPress music theme requires WordPress Video Gallery script to play the videos. The theme includes categories, recent post, and thumbnails with pagination. Boost your music updates with twitter feed field and connect to media via Twitter, Facebook, and LinkedIn icons. 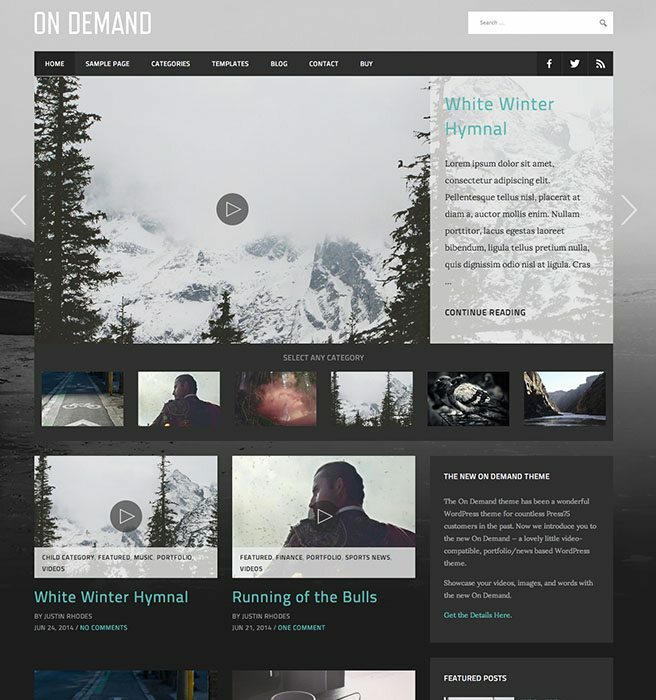 Inspired by Hulu.com, the On Demand theme provides a fully featured Video solution. Another quality video centric theme built with the modern video blogger in mind. WordPress Video Blogging Themes can turn your WordPress blog into a full video portal. Videos can be a useful tool to keep visitors on the blog for longer periods of time. It also offers diversions and flares to an otherwise plain WordPress blog. Hope, you liked our collection of Best WordPress Video Themes of 2019 and if you think, we had missed a really great theme, please let us know in the comments section below, so we can add it to the list as well. Thanks, Freeman Kowalec for the appreciation.